John Lewis Natural Collection 10000 Zip Link Mattress with Goat Angora, Super Kingsize. It’s a medium tension mattress. I’m 6′ 2″ tall and weigh 15.5 stone. I find that I wake up with backache each morning and I’m wondering if I have the right tension? I usually sleep on my back but do sleep on my side sometimes. I note that you would also advise a medium tension mattress for my height and weight. How do your natural medium tension mattress compare with the John Lewis Natural mattress as described above? Unfortunately, it is not possible for us to compare any of our products with products in the John Lewis Natural collection because the description in terms of construction and upholstery in terms of GSM (grams per square metre) is limited. 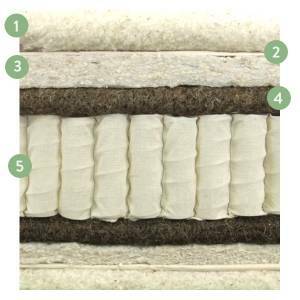 What we can say is that in order for the mattress to have the massive spring count referred to (10000) they use layers of mini springs, which take the place of layers of upholstery. In our opinion, the use of these mini spring in place of upholstery does not bring anything to the table in terms of comfort. All the John Lewis Natural Collection products are made exclusively for them by Harrisons, who do not disclose full details of any of their products. The Artisan Naturals is described as the ‘true medium’ of the natural fibre pocket sprung range. The Naturals is our most popular, unbeatable model with 85% natural fibres. Containing a huge GSM of fillings, including wool and mohair, on a Calico Pocket spring unit. This medium feel hand crafted mattress is where we stake our reputation as ‘The Mattress Specialists’. The closest comparison that we make to the Naturals is the Vi Spring Regal Superb. You are right to assert that we too would suggest a medium tension spring unit for your body weight, as the spring unit is what provides the support which in turn is dictated by your weight. The comfort from any mattress comes from the upholstery, so as you can see, by replacing upholstery with mini springs, the comfort may in our view be compromised, which in turn may result in the mattress being uncomfortable.